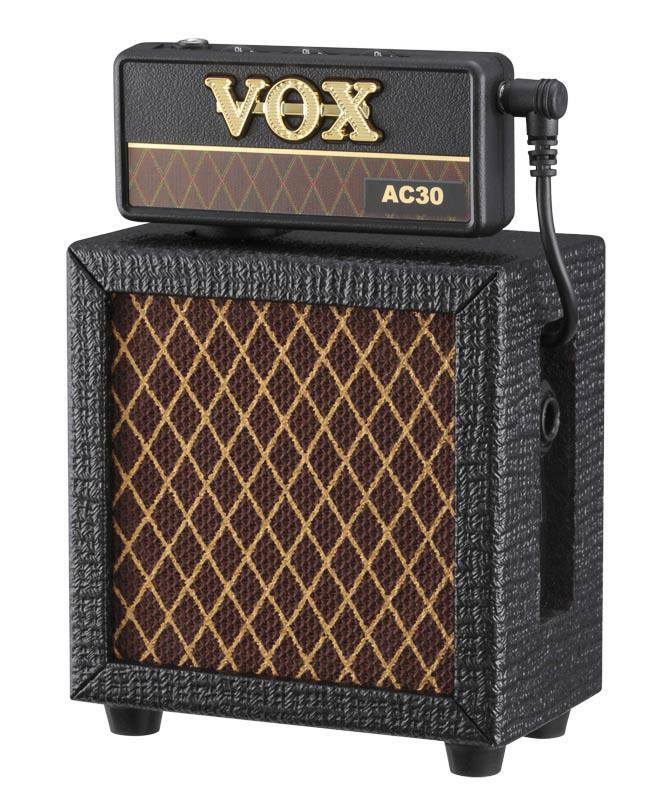 Transform any of the VOX amPlug headphone amps into a tabletop mini-stack amp! Introducing the new amPlug Cabinet – a dedicated monitor speaker that makes playing guitar even more fun. The amPlug series of guitar headphone amplifiers offer a great way to enjoy serious guitar/bass amp sound whenever and wherever you practice. Each amPlug offers an amazing level of sound quality; far beyond what one might expect from a unit of this size. Combined with play-anywhere convenience and solid good looks, the amPlug series have quickly become best-sellers, and continue to attract legions of users. It goes without saying that because the amPlug is headphone amp, you can hear the sound only through headphones. We know there are probably times when you'd like to share your amPlug sound, and that's where this new product comes in! Using the amPlug Cabinet, you can quickly convert any amPlug into tabletop mini-stack. Connection is easy; just insert the amPlug unit into the amPlug Cabinet, and plug the dedicated cable from the amPlug cabinet into the amPlug. With its retro VOX design, the amPlug Cabinet creates an imposing miniature amp stack that is both attractive, and enjoyably incongruous. Equipped with a 3" VOX speaker and 0.7 Watts of power, the amPlug Cabinet is compatible with all amPlug models, so you can use a variety of amPlugs with a single amPlug Cabinet.